Referred to today as Santiago Pueblo, this ancient Tiwa town is featured in the book WINTER OF THE METAL PEOPLE: The untold story of America's first Indian war. It was founded in about 1400 as Ghufoor, the Tiwa word for "parched corn." It was built as a four-sided complex like an apartment building atop a bluff on the west side of the Rio Grande, north of present-day Albuquerque in what is now Bernallilo. It is the same pueblo that sixteenth-century Spanish documents called Coofor, Coafor, Coofer, Tiguex, or Alcanfor. In 1882, the famous archaeologist Adolph Bandelier mistakenly identified the site as the former pueblo of Puaray, resulting in the site being known as "Bandelier's Puaray" for several decades. 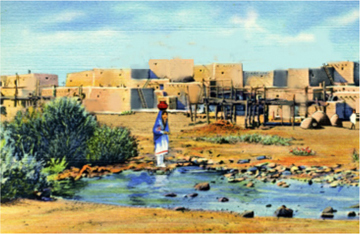 Ghufoor thrived for about 200 years, profiting from its location on a major trade route across a ford on the Rio Grande. The Indian road started at Pecos Pueblo to the east on the edge of the Great Plains. The road crossed the Rio Grande at Ghufoor and went on to the complex of Zuni towns in the west, where the trail dipped southward toward Mexico. Turquoise, buffalo hides, pottery, and other trade items were traded to the south for macaw parrots, seashells, and other goods from Mexico. The trade route was what made it so easy for the conquistador Francisco Vázquez de Coronado and his expedition of Spanish militia and Mexican Indian allies to find Ghufoor in 1540. The word "pueblo" for each of the Rio Grande Indian towns — regardless of tribe — came from that time, because it is the Spanish word for "town" and was used to distinguish the Tiwas and other tribes living in the stone or adobe complexes from nomadic tribes. The Spaniards also referred to the area on both sides of the Rio Grande where the Tiwa pueblos were located as the Tiguex Province, because Tiguex (TEE-wesh) is the early Spanish phonetic spelling of the plural word that Tiwa people used for themselves. Shortly after arrival, Coronado commandeered Ghufoor as his expedition's headquarters. From there he waged the Tiguex War against nearly a dozen other Tiwa pueblos on both sides of the river. Pedro de Castañeda, a horseman in Coronado's army, described how Ghufoor's inhabitants were evicted, writing: "As it was necessary that the natives should give the Spanish lodging places, the people in one village (Ghufoor) had to abandon it and go to others belonging to their friends, and they took with them nothing but themselves and the clothes they had on." The presence of Spanish crossbow points and fired arquebus balls makes it clear the expeditionaries attacked the pueblo to motivate Ghufoor's residents to move out. The Tiguex Province extended from today's Isleta Pueblo south of present-day Albuquerque north to the junction of the Jemez River with the Rio Grande. The war, however, was limited to the area north of Albuquerque, with the expeditionaries operating out of Ghufoor. Unable or unwilling to master the Indian pronounciation for the pueblo, the Spaniards renamed Ghufoor as Coofor in some accounts (and by other names in other accounts). The pueblo came to be known as Santiago, identified in 1602 by that name on a Spanish map. Sometime in the 1600s, Santiago was abandoned and the pueblo deteriorated into a ruin, slowly melting into the ground. 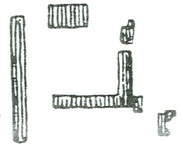 When archaeologist Adolph Bandelier arrived in 1882, he drew the first sketch of what remained of the ruin. By then, all that remained of the 400-by-300-foot pueblo were ridges marking the walls of the pueblo's several hundred rooms. Despite the natives at nearby Sandia Pueblo telling Bandelier that the name of the ruin was Santiago, he insisted on thinking it was a different Coronado-era pueblo named Puaray (pronounced pwahRYE). Today, the site of the actual Puaray has been built over by homes about three miles south of Sandia, on the other side of the river. 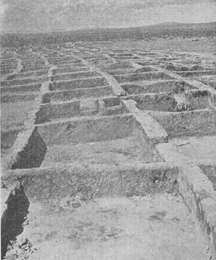 Although other archaeologists realized the site that Bandelier sketched was Santiago, not Puaray, Bandelier's reputation was so dominant that Santiago was called "Bandelier's Puaray" through the 1930s as well as Santiago Pueblo. Despite Bandelier's confusion over the name, however, even he wrote that the site (by whatever name) probably was the pueblo that Coronado had taken over for the army's headquarters. The expedition stayed there in the winter of 1540-41 and again in the winter of 1541-42, after Coronado returned from his trek across the Great Plains. That knowledge elevated Santiago Pueblo into one of the most historic sites in New Mexico — but even that would not be enough to save the pueblo from eventual destruction. In 1931, the Santiago Pueblo site was visited again and sketched, this time by a historian named Reginald G. Fisher. He surveyed the old Tiguex Province, locating the sites of the Tiwa pueblos that had been attacked by Coronado as well as other sites along the Rio Grande after the sixteenth century. 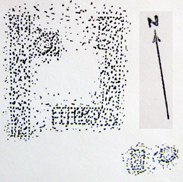 Traces of many ancient pueblos still were visible, and Fisher's sketch of Santiago shows even more detail than Bandelier had been able to record 50 years earlier, including the circular pit of one kiva, where the Tiwas observed their Katsina religion. Fisher wrote that the site was "reduced to mounds from three to six feet high, with no walls standing above the debris. There has been a little vandalism (from pot hunters). It was originally two or three stories." Because of Santiago's association with the Coronado Expedition, it was the first of the Rio Grande pueblo sites to be excavated by a University of New Mexico archaeology research team in early 1934. In the south wing of rooms, archaeologists made a stunning discovery. They found a Tiwa skeleton with a copper crossbow point in its chest cavity. Because Coronado led the only Spanish expedition armed with crossbows, discovery of Santiago's skeleton verified that Santiago's inhabitants had been attacked by the Coronado Expedition in 1540. Bernalillo was across the river, but in the 1930s there were no homes in the area around Santiago Pueblo. Despite its historic value, and its standing as an ancestral home of the Tiwas, the pueblo site was doomed because it was situated on top of a gravel cliff. In the 1950s the entire site was obliterated by bulldozers quarrying the gravel to a depth of about 15 to 20 feet. Beginning in 2006, a housing development was built on and around where the old historic pueblo had been located. The name of the new housing development: Santiago. The unmarked Santiago Pueblo site is in the Santiago housing development east of state highway 528. A Spanish building southeast of the former pueblo was built in the 1600s, probably as a "visita" (Catholic chapel). It might also have been a colonial ranch house. Puebloans apparently demolished it in the Pueblo Revolt of 1680. The sites of several much older Indian pithouses also were discovered in the area. A nearby archaeological discovery occurred in 1986, about 400 meters west of the pueblo site, when road-widening machinery exposed charcoal-stained areas next to highway 528. Archaeologists called in to investigate found the remains of a sprawling campsite attributed to Coronado. The members of the expedition who did not move into Santiago for shelter — probably mostly the Mexican Indian mercenary warriors as well as the expedition's African and Indian slaves and servants — camped in that area outside the pueblo walls. Found items included metal from chain mail vests and an obsidian blade from around Mexico City that came from an Aztec maquahuitl weapon. The Coronado Campsite, the acreage west of the Santiago site, is owned and protected by The Archaeological Conservancy, with Winter of the Metal People author Dennis Herrick as the site steward. The walls of the historic pueblo of Santiago, however, are lost forever. Only knowledge of the pueblo's original location and its history remain.